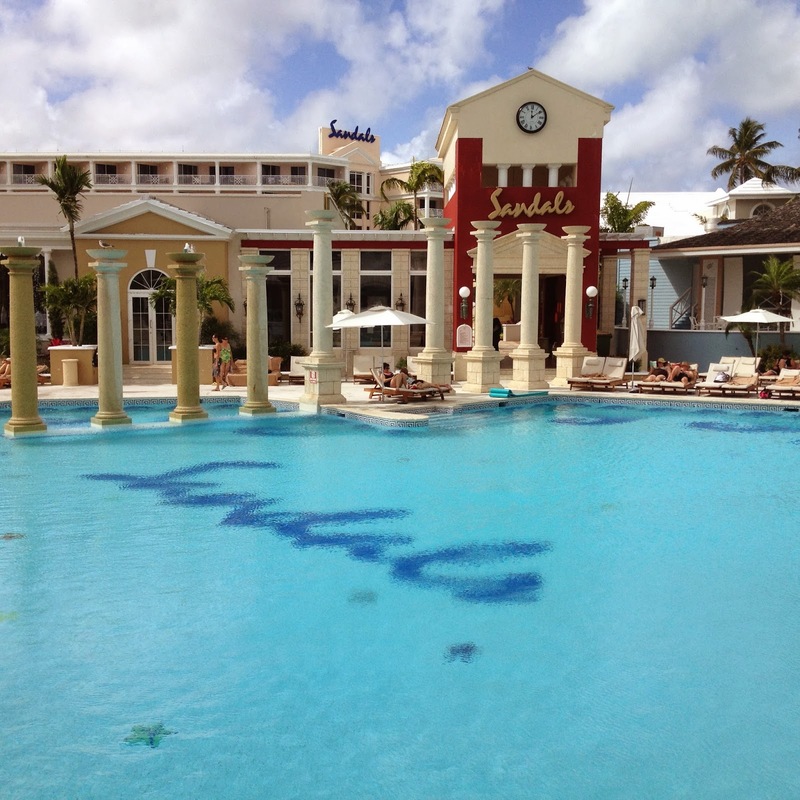 Recently, my husband Robert and I attended a training seminar on Sandals Weddingmoons at Sandals Royal Bahamian. We enjoyed a few days down at the resort, one of them spent on learning and the other spent on relaxing and experiencing the property. 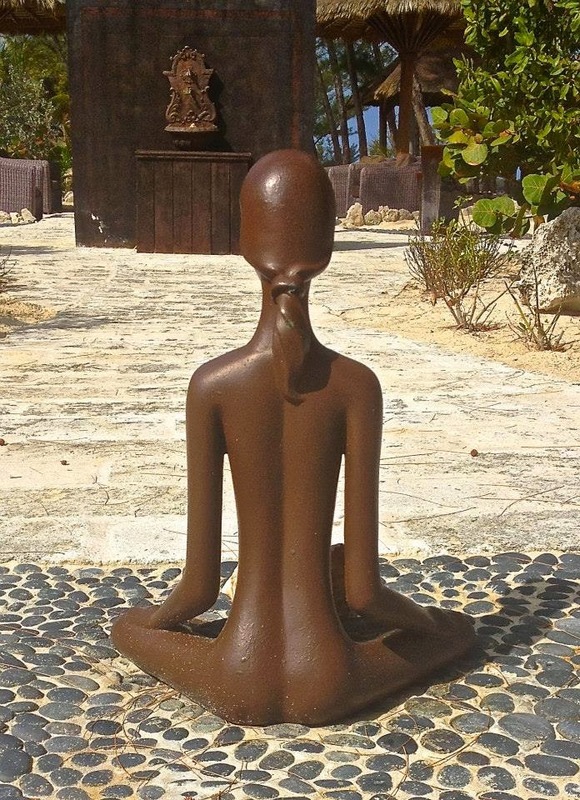 Of course, whenever I'm down at the resorts I always try to turn off my work mode and get into guest mode. I want to see the resort through the eyes of my clients so I know how to properly match my clients up with the resorts they'd be happiest at. During this trip, Robert and I ate at the various restaurants, we enjoyed the nightly entreatment and the daily water sports activities. But there was one thing I was dying to try. The couple's massage. Of course it didn't take much convincing before Robert agreed to 50 minutes of total relaxation. Our butler was kind enough to reserve us a the morning's first appointment in a hut on the beach on the Sandals' private island. The next morning we made our way out to the island by boat. I tried to contain my excitement, but the truth is, on these "business" trips my husband and I rarely get some alone time, so for the first time in a while it felt like it was just the two of us on a super-romantic Sandals vacation. 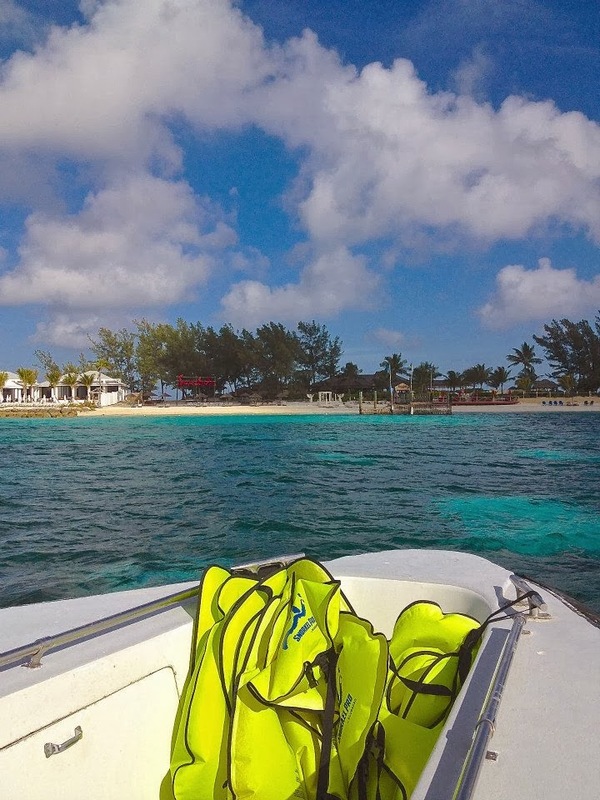 Pulling up to Sandal's Cay, the Sandals private island in Nassau, Bahamas. Once off the boat and on the dock we were greeted by a resort employee who whisked us away to the Red Lane Spa. Sign by the dock for the Red Lane Spa. 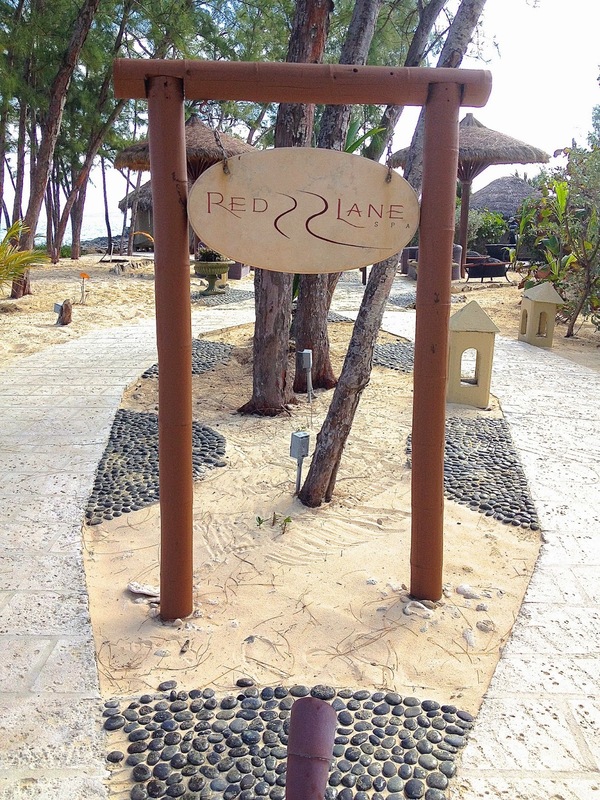 Now, many of you who have been to Sandals or Beaches Resorts may have an idea of what the Red Lane Spa is. 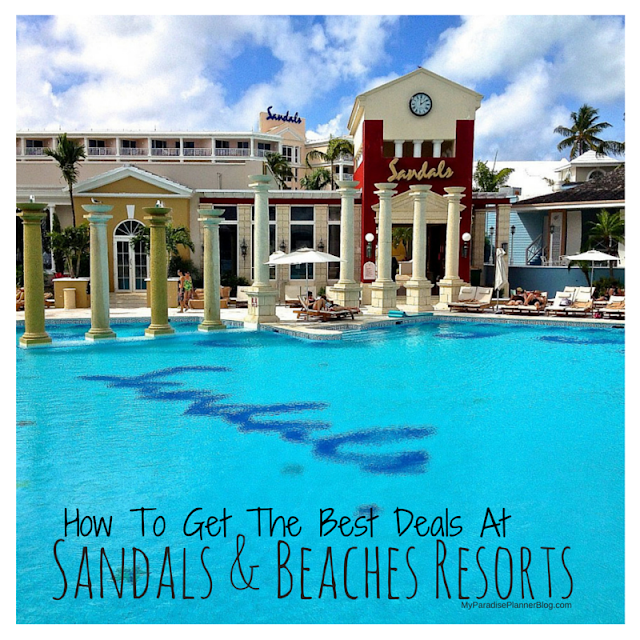 It's Sandals & Beaches' signature spa and they have one on every single property. Normally when you walk into the spa it's indoors, airy, cool, and the signature scent of lemon grass tickles your nose. 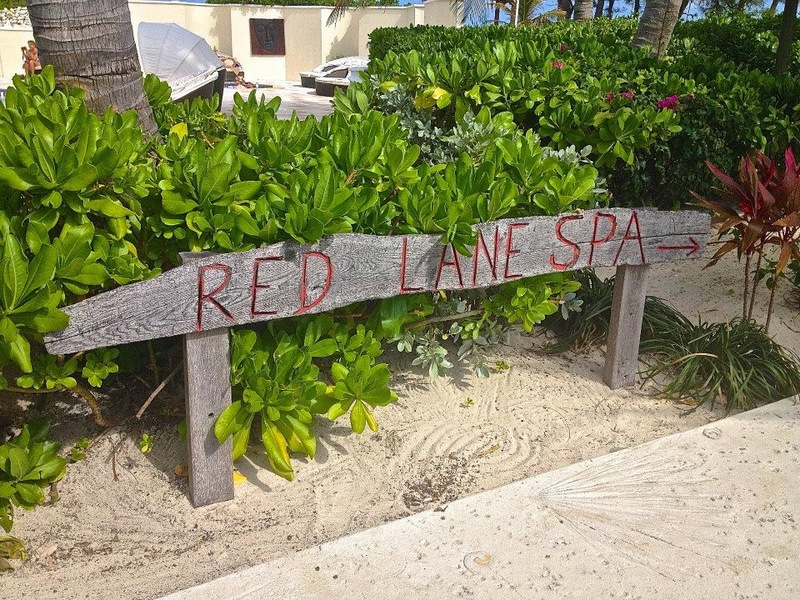 At this Sandals Resort, there are two Red Lane Spa's. The first, is indoors and similar to it's sister properties. But the second is just a small cluster of 5 open air huts on the far end of the private island. Two huts face one side of the island, and the other two fact the other side, while the hut in the center holds a desk for the spa attendants. Inside the "check-in" hut are various samples of oils and creams, as well as some deliciously refreshing fruit-infused water. We sat down with the spa attendant and filled in our paperwork. "No-- no prior medical conditions." "No-- no allergies that we are aware of." "Most of my tension is located in my neck and shoulders..." The usually forms you fill out when having a massage. Once we were done, the attendant led us to our hut. We stood outside as she rolled up the privacy screen, a screen that allowed whoever was inside to see out, but didn't allow those on the outside to see in. The view was breathtaking. Our tables, side by side, on the beach. Before the attendants left us to get ready, they had us pick out our scents. Robert choose the more masculine smelling oils and I choose the signature lemongrass scent, because it will forever remind me of Sandals Resorts. Within a few short moments we were comfortably nestled under the blankets and feeling the cool island breeze hug the sheets around us. 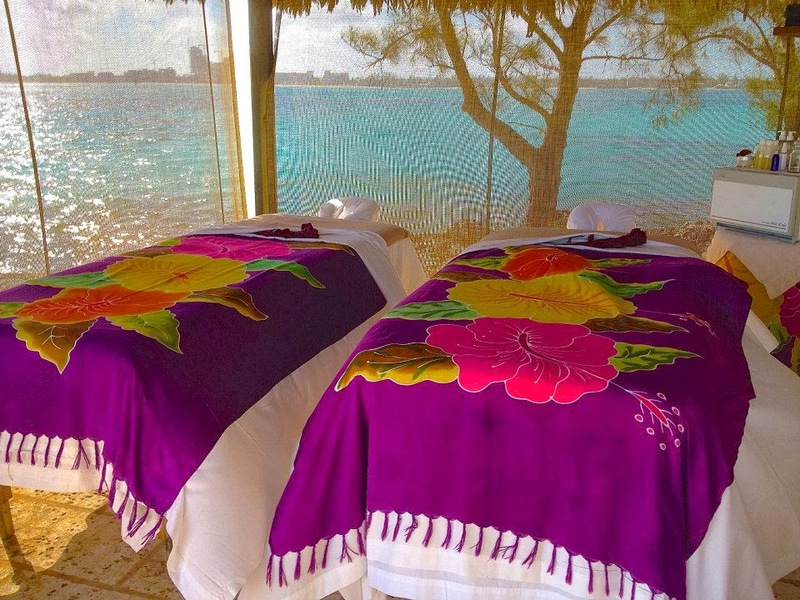 By the time the spa attendants had returned to begin the massage, the gentle waves hitting the shores around us and the rustling of the palm trees above us were enough to almost lull me to sleep. The attendants got to work and no music or soothing CD's played. Just the sound of the nature around us was enough to do the trick. We were completely relaxed. Now I'm no massage snob but I've had my fair share of massages in my life time-- all I can say is WOW. I didn't even mentioned my "trouble areas" to the massage therapist, but she found them all and worked them all out. The kink in my low back/hip and pain in my arches from walking 6 miles every day were pretty much gone by the time I got off that table. The tension in my neck from sitting at my computer all day was gone too. But regardless of the wonders my massage therapist worked on my body, my favorite part of the massage was the very end. We were laying face up, with cool scented towels over our eyes, and all of a sudden I felt a hand holding mine. The attendants had placed my hand in Robert's before telling us the massage had come to an end and we were free to relax a little longer if we liked. So we laid there for a few minutes, hand in hand, basking in the island breeze and the scents and sounds surrounding us. Inevitably we had to get up and dressed, but after changing into our swim suits we thanked the spa attendants, tipped them very well, and made our way over to the beach we'd been listening to for the past hour. The beach near where we had our massages. Lucky for us, it was still morning and the island was practically empty. 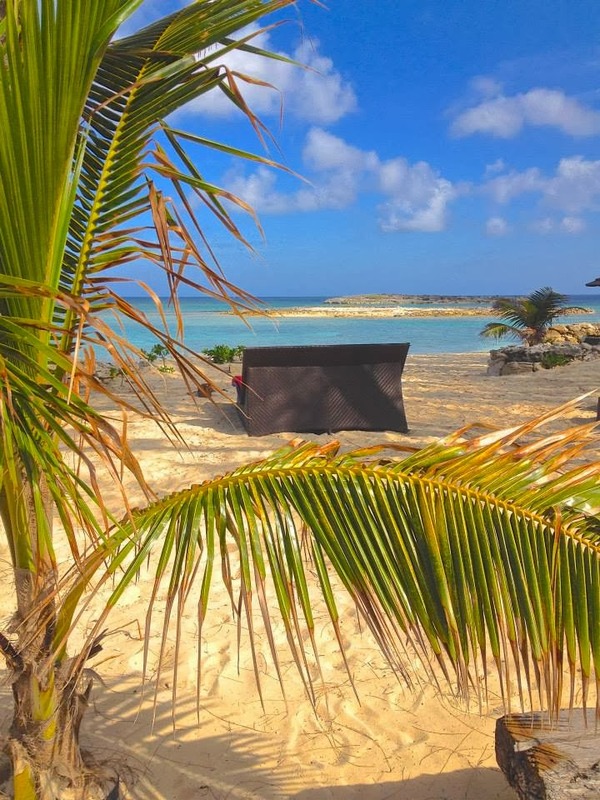 We found a beautiful private spot to lay down and relax before venturing over to the restaurant on the island for lunch. Double bed on the beach. It was the perfect morning, and just what we needed to help us enjoy our free day with each other at a resort where "Love Is All You Need". Was this information helpful? If so, please consider booking your next Sandals or Beaches vacation with me. 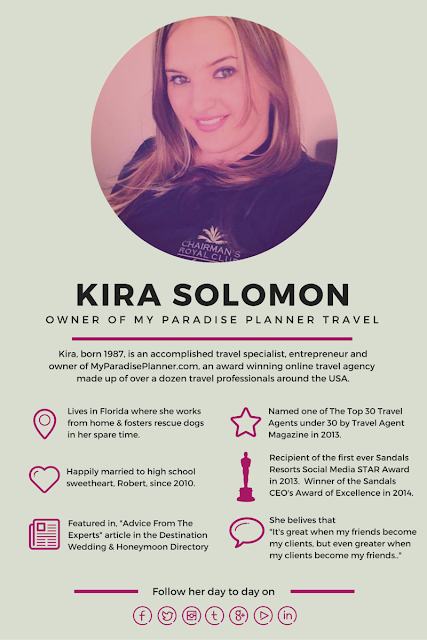 My services are 100% free for you to use and the price will be the same you'd get by booking anywhere else-- the difference is you'll be getting my valuable expertise before, during & after your trip. 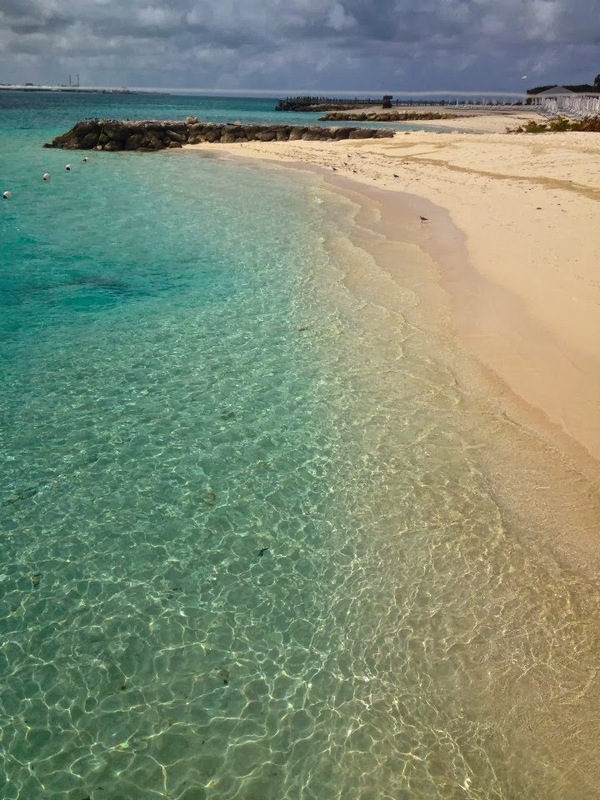 Still prefer to do it on your own, then consider booking directly online through our co-branded Sandals or Beaches website. By booking through there Sandals will know we referred you and will give our agency credit for the help we provided through this blog.